If you came of age while protesting against the Vietnam War, then Joe (1970) was your worst nightmare, starring Peter Boyle as a badass bogeyman. As Joe Curran, a flag-waving, beer-swilling, gun-loving, foul-mouthed factory worker who hated hippies, minorities and homosexuals with a genuinely scary (and ultimately homicidal) fury, Boyle made the sort of indelible impression that can instantly turn an actor into an icon. To be sure, he later displayed impressive versatility in a wide variety of movie and TV roles, playing everything from a tap-dancing Frankenstein's Monster to a savvy Senate campaign advisor to everybody’s favorite curmudgeonly paterfamilias . But I must admit that I never got over my first impression of the guy as the hardhat from hell. (If you’ve never seen Joe – think Archie Bunker with no redeeming qualities, and ready access to deadly weapons, and you’ll get the idea.) And that impression was only reinforced when I saw his Emmy-nominated performance as Sen. Joe McCarthy in the 1977 TV-movie Tail Gunner Joe. Indeed, I couldn’t help thinking when I saw Boyle more recently as the viciously racist grandfather in Monster's Ball that, hey, there’s Joe Curran again – older but no wiser, and still as nasty as he wants to be. 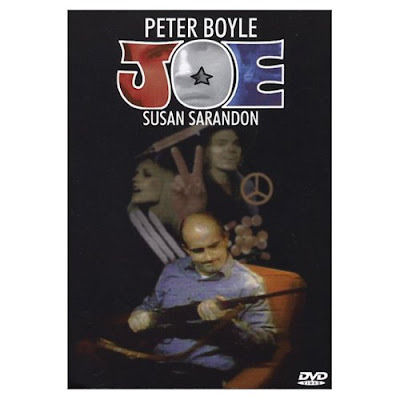 Given Boyle’s real-life political leanings – he was a self-described “conservative radical” who performed in ‘70s anti-war revues with Jane Fonda and Donald Sutherland – I guess he’s a textbook example of a great actor: Someone who can successfully and stunningly turn himself into something he’s absolutely, positively not. Here is a link to an enlightening 1970 New York Times interview with Boyle that ran while Joe was all the rage. And here is his Associated Press obit. I'm only 30, so I'm not as familiar with Boyle's early work as I probably should be. However, it still saddens me that mentions of "Everybody Loves Raymond" are preceding "Young Frankenstein" in some of the obits I've been reading. I saw that film when I was senior in high school in 1970 at a theater in Carmel, California. Joe completely blew my mind. I was never able to look at Pete Boyle agian without thinking about his role. In fact I was just talking about my reaction to the film to a friend and thought I should look it up to make sure I remembered it correctly. I did find out the Peter was born in Norristown Pa. at town I lived in until 1967. Hard to believe his real self was far less violent. Although like most people we believe the person on the screne is the real person. Films can be powerful for that reason, and decieving. My favorite film these days is 'Little Buddha.' It has more redeeming qualities then a meditation on hatred.